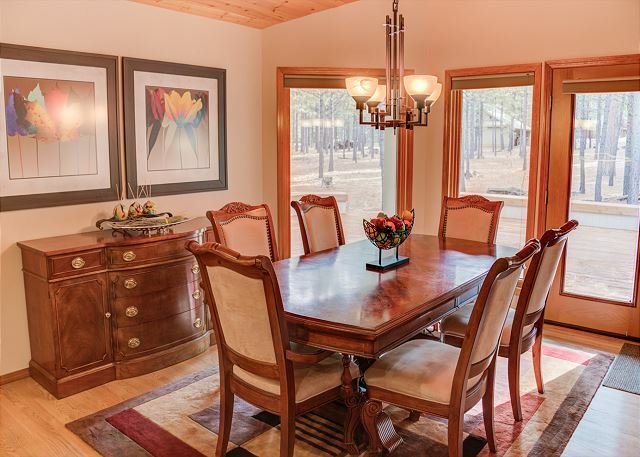 Expansive windows look onto the large decks which run the entire length of the home, and private, wooded home site. 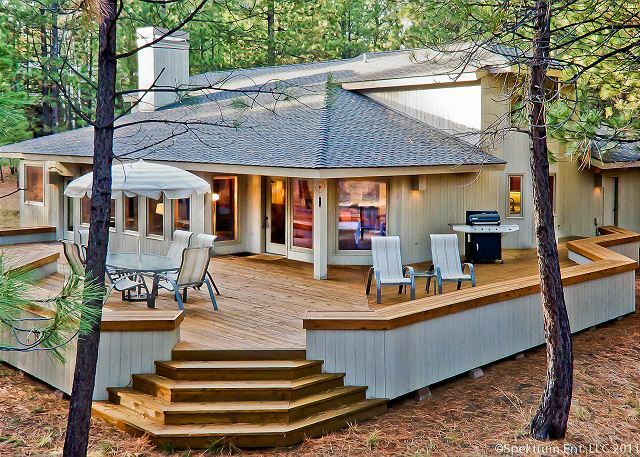 The deck is secluded and allows for private sunbathing or provides an ideal area to fire up the gas grill for those family evening bbq's after long days of fun in the sun. 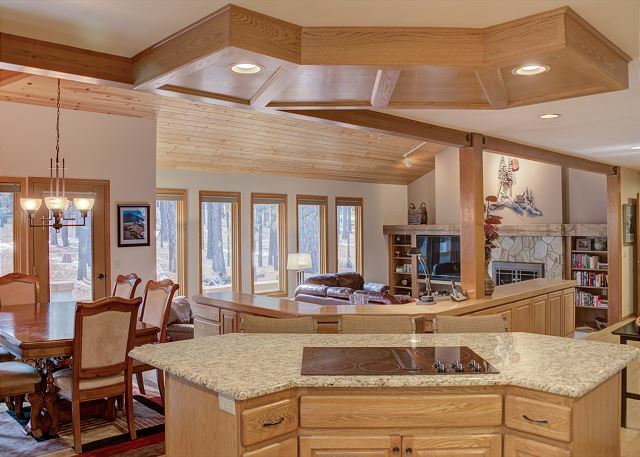 The open floor plan is a spacious 2,527 sq. feet. The kitchen and dining are open to the large living area, allowing the cooks to always be in the action. Wall to wall windows on the south side provide a light and bright space and forest views. 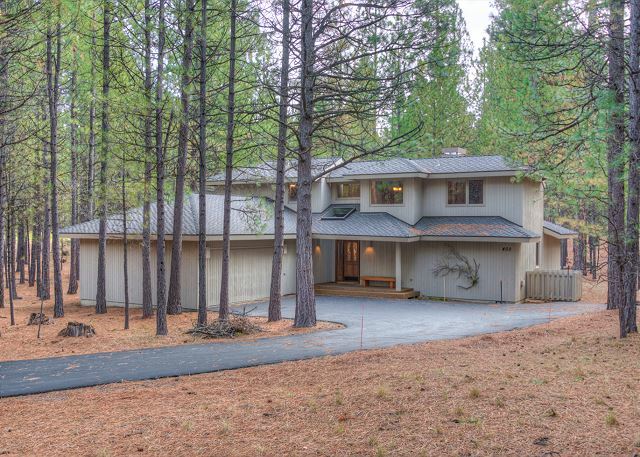 A large wood-burning fireplace will give ambiance and warmth on those cool Black Butte evenings. 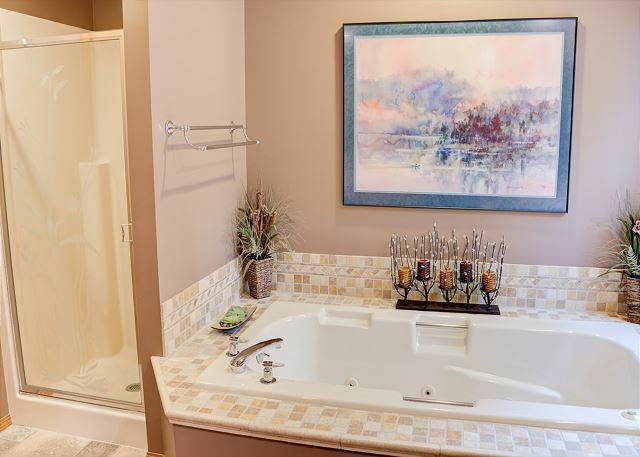 The large master king bedroom and bath with jetted tub are just off the living area with a large walk-in closet. A 1/2 bath in the entry and laundry room off the kitchen complete the main living area. A large two car garage is off the laundry room. 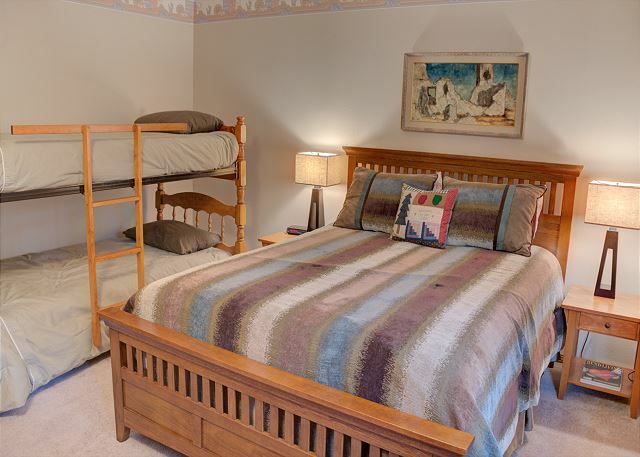 Upstairs is a king bedroom and down the hallway is a bedroom with a queen and one set of bunks. 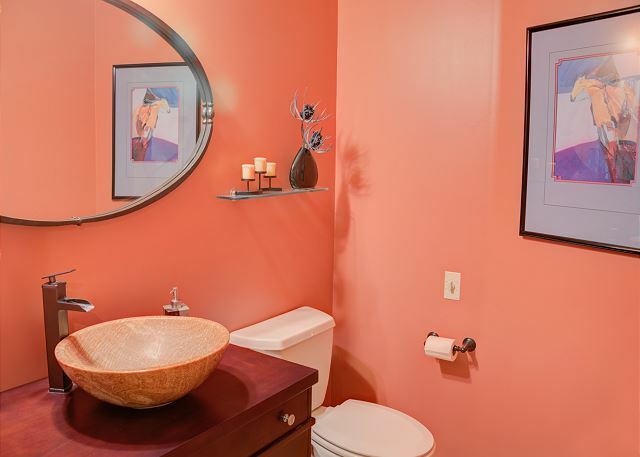 A full bathroom with a combination tub and shower is in the hallway and shared by both bedrooms. GM#402 is tastefully decorated and comfortable and will provide a lovely sanctuary for a relaxing vacation. 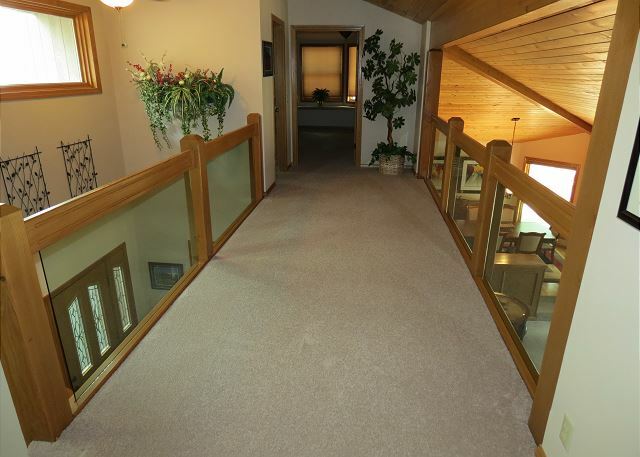 This home is great for three couples, a golf group or small extended family. The Glaze Meadow Pool and tennis court are a bike ride away. Air conditioning and wireless internet complete the package for your perfect vacation! This home was beautiful and so well laid out and decorated. They had everything you could want in a rental home. Thank you so much for taking the time to review GM#402. It is a special home and we appreciate your kind comments. The house was clean and well stocked. We had a problem with a toilet and the property manager sent a plumber out right away. This was the second summer we rented 5his house. House is perfect for 6 adults and 2 children. Well stocked. Very quiet location. Quiet neighbors. Good walk to Glaze Meadow Pool (1.75 miles) and easily accomplished. 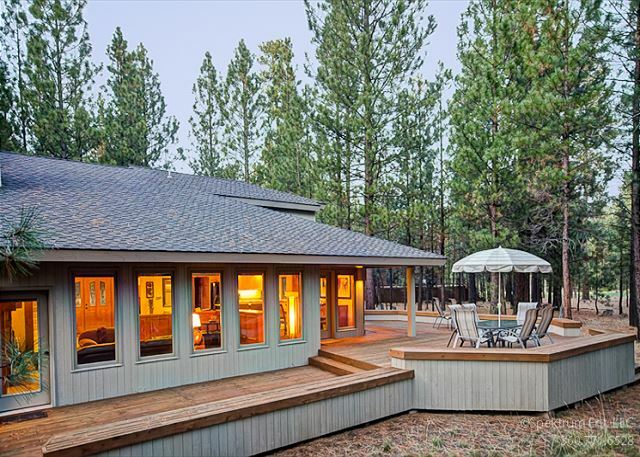 The big back deck overlooks an enclosed wilderness area that the grandkids explored. The house on the other side was far enough away that we couldn’t see or hear them. Glad to hear you and your family enjoyed this wonderful home. Thank you for booking through Howells. Hope to see you again next year! The home was nice and we enjoyed our stay. There were a few minor issues. (1)drip coffee pot does not have a caraffe (looked everywhere), (2) some of the cookware had dried food on it, (3) there were no extra large garbage bags to use (first house I've stayed in that didn't provide some extra bags), (4)dishwasher was full of dishes to be unloaded when we got there. These were fairly minor items though and we enjoyed out stay in this house. Great house. Had everything we needed. This was a very comfortable house for our work retreat. The kitchen is well stocked with cooking utensils and pans. We will plan to stay here again next fall. Great house; will plan on renting again. Perfect space for 3 generations of family. The large deck was a place that the grandkids could safely run around on. The appliances were in good working order and plenty of dishes for serving and eating. We liked the short distance to the new Upper Glaze Meadow Pool and were easily able to walk there. This was the best-stocked vacation rental we've had in 30+ years. The house was roomy and easily accommodated our family of six as well as two other families we had over for dinner a couple of nights. We couldn't have been more pleased with it. you rent meets your every need! They go way over the required service and all are so pleasant!